The Golden Bandicoot is a ground dwelling marsupial that is largely nocturnal and solitary. The golden-brown fur on their back and sides that is covered with stiff long black guard hairs distinguishes them from other bandicoots. 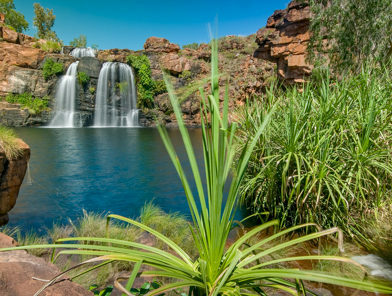 Populations of the Golden Bandicoot now only occur in the rugged high rainfall areas of the far northwest Kimberley Region in Western Australia and on a handful of offshore islands. 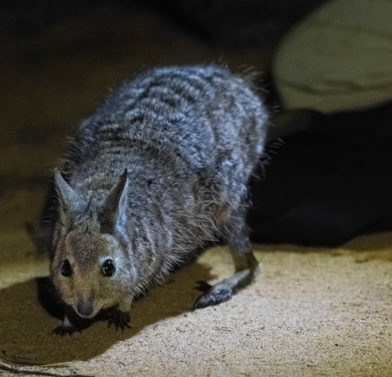 AWC is protecting the population of Golden Bandicoots at the Artesian Range by implementing fire management (prescribed burning), eradicating feral herbivores and researching ways to reduce feral cat activity. AWC is conducting vital research to understand the impact of feral cats on native fauna and investigate methods of control. At Artesian Range, we are encouraging a stable Dingo population as this has potential to help reduce feral cat activity. The demise of the Golden Bandicoot across much of Australia has been largely attributed to predation by feral predators (mainly foxes and cats). The Golden Bandicoot persists on offshore islands where there are no foxes, cats or dogs, and its extinction on Hermite Island in 1912 was timed with the introduction of feral cats. 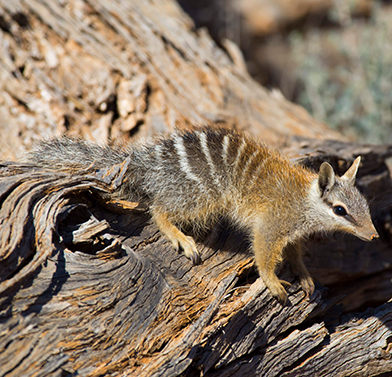 The rugged sandstone country of the Artesian Range may provide some protection from cat predation due to its complex and undulating terrain. 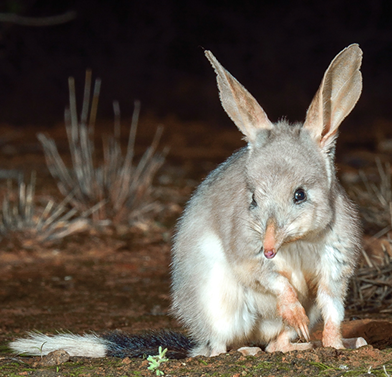 The bandicoot may also be threatened by altered fire regimes – especially the increase in frequency of intense wildfires. When foraging at night the Golden Bandicoot moves between clumps of grasses and makes small conical diggings for its diet of insects, small vertebrates, roots and tubers. Adult Golden Bandicoots have a head-body length of 19 – 30 cm, tails of 8 – 12 cm, and weigh 250 – 680 grams. Golden Bandicoots have an incredibly short gestation time of just under two weeks, breeding is thought to increase after substantial rain, and a female may give birth to two or three young at a time.